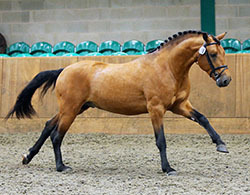 Killour star is a Class One Connemara stallion with some of the most famous true to type and performance bloodlines available within the Connemara gene pool. Sire: His sire, Dooneen Supermatch, is by the legendary Frederiksminde Hazy Match, who has sired record number of graded Class One Stallions and is currently Ireland’s leading sire of performance ponies and has been so for the last decade. 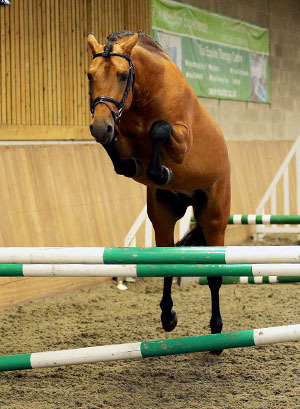 Hazy Match’s stock are well known for having good conformation, extravagant movement and true performance and they have competed in major championship shows all over the world including HOYS and winning RIHS and Clifden Supreme Championships. 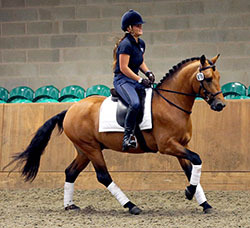 Hazy Match has also sired many Grand Prix Showjumping ponies in Germany, Chamade de Renival who competed for Belgium the 2010 Pony European Eventing Championships, as well as top performance ponies in Ireland and the UK. Hazy Match is Licensed in Germany, Belgium and Ireland and gained Elite status in Germany. Dam: Lough Mask Lee was successfully shown in-hand and is a noticeably prolific broodmare producing true performance progeny. Damsire: Slaney goes back to Thunderbolt who is renowned for passing on substance, correct conformation & scope and, as a sire, he is responsible for many successful progeny in showing, jumping and eventing. Starting as he means to go on Star was a Champion Foal in Ireland. Then, as a 3 year old in 2016, on his first outing he was Supreme Champion in exceptional company, including approved stallions and on his 2nd outing he was Reserve Supreme with exceptional comments from panel judges commenting especially on his bone and length of rein. 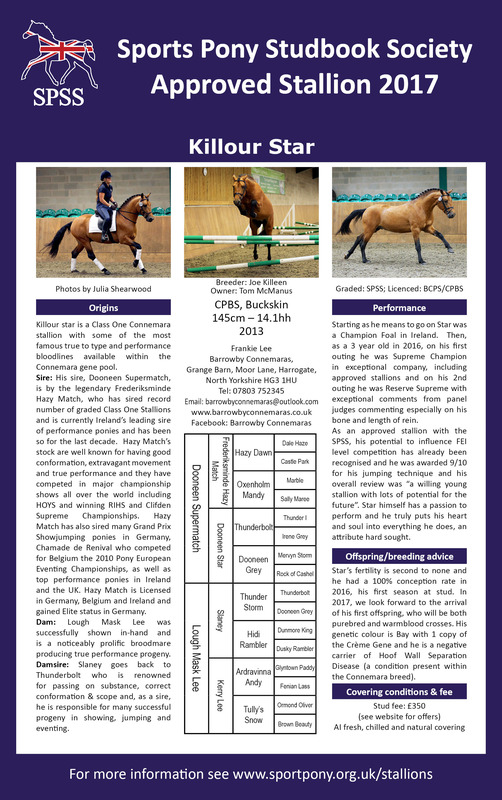 As an approved stallion with the SPSS, his potential to influence FEI level competition has already been recognised and he was awarded 9/10 for his jumping technique and his overall review was “a willing young stallion with lots of potential for the future”. Star himself has a passion to perform and he truly puts his heart and soul into everything he does, an attribute hard sought. Star is homozygous black and agouti with 1 copy of the Crème Gene, so he cannot produce black, chestnut or palomino foals and can only breed bay or buckskin (unless the mare has a dominant modifying gene like Crème, grey or tobiano for example). He has tested negative as a carrier of Hoof Wall Separation Disease (a condition present within the Connemara breed). Star’s fertility is second to none and he had a 100% conception rate in 2016, his first season at stud, and a 92% conception rate in 2017. His first offspring, who will be both purebred and warmblood crosses, arrived in 2017 and are boasting exceptional quality with bold characters, correct conformation and athletic ability. Of note Barrowby Matchmade achieved a coveted SPSS Gold Premium and was Champion Foal at NECG Connemara Breed show & Champion British National Foal of the Year Show 2017.